How did you manage the pressure of fame and money? What are the lessons you want to pass on to the next generation of cricketers? Laxman: When the bank balance at a young age is crores of rupees, it is difficult to handle the situation. When you are into a sport, you can leave a legacy behind only when you achieve excellence and you can do that only when you have longevity. For that, you cannot forget about passion and become complacent. Money is a by-product of what you’re trying to achieve. Do famous international players run the risk of becoming a product themselves? Does a situation arrive when they’re being sold more than the sport and their achievements? 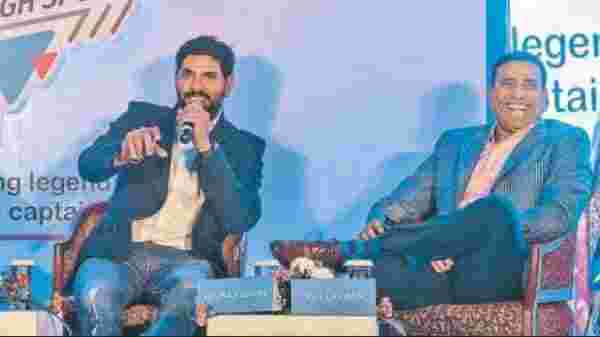 Yuvraj: With more technology, social media and news, there will be more views. Sometimes you lose yourself to it. When you get better at the game, you get all these advertisements and recognitions. It happened with me too, when I was younger. There were times I got distracted and did not go to the ground. I did not have the right seniors around me. It is their responsibility to keep a check on whether the youngsters are high or on a low and tell them that it’s okay to be distracted, make mistakes and learn. There has to be some sort of guidance to tell them that they should focus on their game, be the best and everything will just follow. The younger generation does not know how to handle all the money coming in and as a society, we need to be there for them rather than criticise them. While beginning your respective careers, did you ever think what you would do after retirement? Laxman: Education is the pillar of success. If you are not educated and you are only relying on the sport, then you will always feel insecure that if you are not successful in the sport, you won’t not have anything to do in your life. Education will give you independence and confidence, so that even if you do not succeed in the sport, you will have something to do in your life. The basic principle of sport is doing your best and being in the present. If you are thinking about what’s going to happen post retirement, you are compromising on the present. The biggest mistake is to think too much ahead. Once you have a long career, the opportunities will be endless, even after retirement. What is your investment style and is it similar to your cricketing style? Yuvraj: It definitely depends on your personality. I am someone who is always willing to take risk. If I do not jump, I would not know. With the ball, if I want to hit that six, I have to take the chance and investments are also the same. It also depends on what you want from it. I feel it is more about making a difference to the society and being remembered for good work. Laxman: I have a different view. Your investment is something that you have to have faith in, just like your game. Once I have the trust and confidence that it is the right investment for me, automatically I’ll put money in that portfolio. I was a bit of a risk-taker and a conservative player on field, hence my investment is also a bit of both. As a player, if you are not taking risks, you will not be successful and it is the same in any walk of life. There has to be a mix of taking risk, playing conservatively and investing in something which is a proven portfolio. It is also very important for people who have done well in their life to contribute to the society. Part of the investment should also be about that.